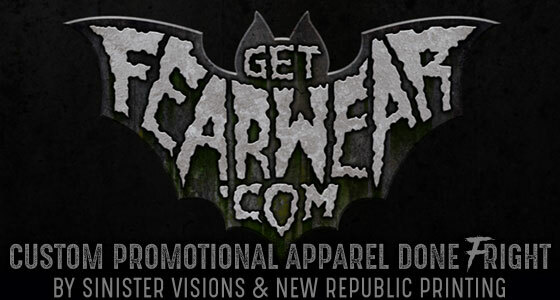 Sinister Visions News and Updates: Announcing FearWear - Your Spooky One-Stop T-Shirt Solution! Announcing FearWear - Your Spooky One-Stop T-Shirt Solution! I'm pleased to announce FearWear: Custom Promotional Apparel Done FRIGHT! A one-stop t-shirt solution from Sinister Visions and New Republic Printing - get your shirts professionally designed, printed and shipped, all for one (reasonable) price! We're cooking something pretty cool up for TransWorld's Halloween & Attractions Show, so be sure to join the mailing list to be notified when we announce it closer to the show! Full details and packages at http://www.getfearwear.com!